Astounding views, comfortably in reach. Wherever your passion lies, this outstanding super telephoto zoom lens can bring it into focus. Capture and share stunning views of birds, wildlife, motorsports, athletes, performers, landmarks and other faraway subjects. A fast f/5.6 constant aperture gives your shots beautifully out-of-focus backgrounds across the entire zoom range. Turn fast-moving action into dazzling photo sequences—the electromagnetic diaphragm operates in sync for the fastest subjects and shutter speeds while Vibration Reduction image stabilization keeps your shots sharp and steady. 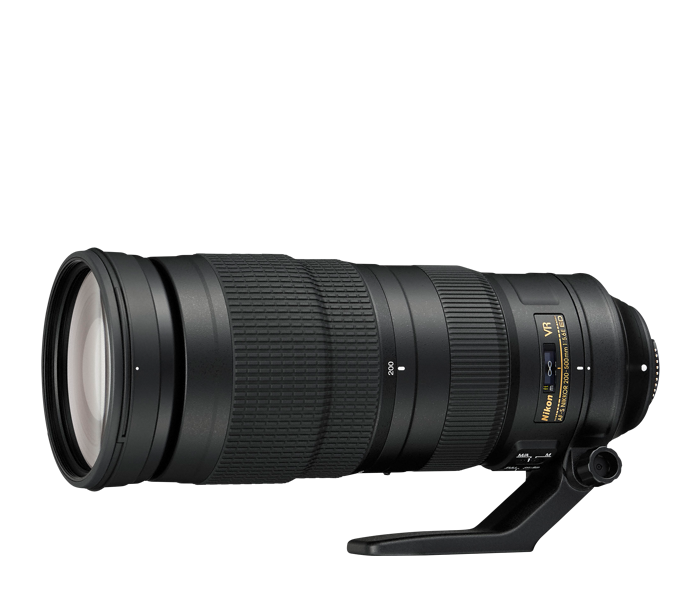 And in the rare cases when additional reach is needed, you can increase the AF-S NIKKOR 200-500mm f/5.6E ED VR's zoom power with an optional Nikon 1.4x, 1.7x or 2x teleconverter*. Whether your subject is far in the distance or close, fast or slow, you can land the shot. On FX-format cameras, 500mm brings distant birds, wildlife, athletes, performers, landmarks and more into tight focus. DX-format cameras add an additional 1.5x zoom effect for an angle of view equivalent to a whopping 750mm! And despite that extreme power, you can also focus on subjects as close as 7.2 feet away for detail rich close-ups. At super telephoto distances, the smallest camera movements can cause image blur. Vibration Reduction image stabilization counteracts camera shake up to ~4.5 stops** for sharp photos and steady videos. You also can shoot at slower shutter speeds in low light—great for those magic moments at dawn and dusk. Sports Mode is optimized for camera pans and other movements common when shooting fast action. Extra-low Dispersion (ED) glass cuts through the glare of bright sunlight. Silent Wave Motor (SWM) powers ultra-fast, near-silent autofocusing with seamless manual override. The Electromagnetic diaphragm (E) operates in sync with the fastest shutter speeds and frame rates, even when using an optional teleconverter. Always bring home views that amaze. *Compatible with TC-14E series teleconverters (AF is only available when used with DSLR cameras that offer f/8 support. These include: D4, D4S, Df, D600, D610, D750, D800, D800E, D810, D7100, D7200). Compatible with TC-17E and TC-20E series teleconverters (AF not possible). **Based on CIPA Standard. This value is achieved when: FX-format compatible lenses are attached to an FX-format digital SLR camera and zoom lenses are set at the maximum telephoto position.